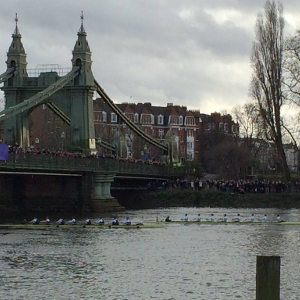 London -Former Olympic champion James Cracknell became the oldest Boat Race winner as Cambridge defeated Oxford by one length on Sunday. Cracknell is a double-Olympic gold medallist and six-time world champion, but this was the 46-year-old's first taste of glory in the annual race between the two English university crews on the River Thames in London. Inspired by Cracknell, Cambridge battled to victory in a feat dubbed "off the scale" by his former Great Britain rowing colleague Matthew Pinsent. Eight years older than the previous record holder, Cambridge's 1992 cox Andy Probert, Cracknell suffered a traumatic brain injury in 2010 when fracturing his skull in a bike accident in Arizona. Cracknell refused to bow to that setback, battling back to top form and fitness. And after last week confirming the end of his marriage to Beverley Turner, the Peterhouse College masters student pulled off an extraordinary personal achievement. "On the start I thought 'I've missed this'," Cracknell told the BBC. Cracknell's fellow former Olympian Pinsent said: "It's extraordinary that he's got himself into the shape, at 46, of a 24-year-old. "I only know one person who could do that, and it's James. It's just off the scale." "Training alongside my team-mates has been unbelievable. It's been a pleasure."